Italian painter, a native of Viterbo, who settled at a relatively early age in Rome, where, he stayed with the Viterbese painter Tarquinio Ligustri, who proved instrumental in acquainting the artist with the aristocratic Crescenzi family. This introduction not only brought Cavarozzi into contact with an eminent family of patrons, but also friendship with the painter and architect Giovanni Battista Crescenzi, who had trained in the studio of Pomarancio and who would later, in 1617-19, take Cavarozzi to Spain. Cavarozzi moved into the Crescenzi palace near the Pantheon and his close connection with this family led to his being nicknamed "Bartolomeo del Crescenzi". The earlier of only two securely datable paintings is his St Ursula and Her Companions of 1608, originally painted for the eponymous Roman church and now in the Basilica di San Marco, Rome. It was not until the second decade of the seventeenth century that Cavarozzi became associated with the young generation of Caravaggisti in Rome. He has been identified as the author of the figures in collaborative compositions with the Master of the Acquavella Still-life. Consecrated in 1622, his Visitation for the chapel in the Palazzo Comunale in Viterbo renders details such as the wrinkled skin on St Elizabeth s neck with particular sensitivity. Throughout his life he painted religious subjects, particularly favouring images of the Madonna and Child, of which a number of variants exist. The tenderness of these solidly modeled mothers with their wriggling babies is reminiscent of those of Orazio Gentileschi, to whom Cavarozzi s work has sometimes been misattributed. 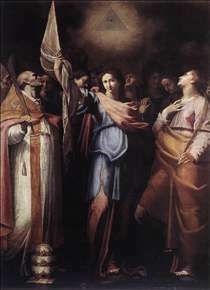 See more details about "St Ursula and Her Companions with Pope Ciriacus and St Catherine of Alexandria"